ur Ecommerce web design and development services focus on building a foundation for increasing traffic, customer acquisition and revenue. 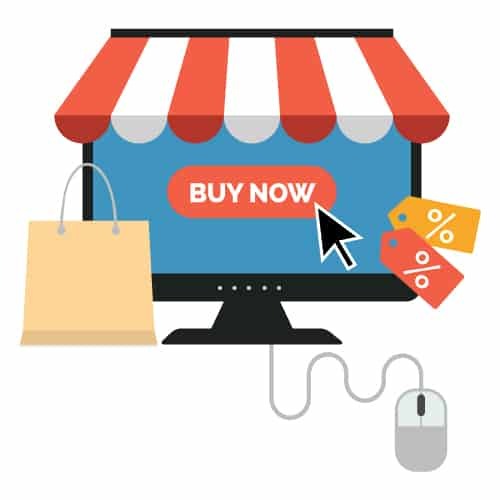 Depending on your product line and your online sales objectives, we have four main options for your storefront. We take the time to identify your goals and to build a strategy to help you successfully sell products online. From WooCommerce to Shopify, from digital downloads to BigCommerce, we design for effective usability, optimizing your products, layout and content to enhance your customer’s experience. WooCommerce is a self-hosted solution designed for small to large-sized online merchants using WordPress. A self-hosted solution for WordPress Users. Perfect for those businesses or organizations selling digital products. A cloud-based platform with many built-in features that you would need to sell online, with many marketing-tool integrations. Depending on your requirements, Big Commerce may be an option. A cloud-hosted ecommerce platform, mobile ready with flexible pricing. With every e-commerce project, we take the time to learn about your sales funnel and will optimize your design, layout, and content to produce the best results. We will work with you to build a website that people will find easy to navigate and will want to use. We’ll analyze your short and long-term sales goals and will recommend the best e-commerce platform to build your e-commerce website foundation. Piper Web Design is ready to help you with your website redesign project, or migration from another platform, and will help you take your business to the next level. With consumers spending more time on the phones, we take the time to make sure that your website works well on all sizes of major devices. And, once your website is online, we can help with additional marketing services to help promote and grow your business.